Is there a option for finite worlds? I don't like a infinite world. I prefer something that is smaller and manageable because I plan to develop most of it. I heard the Xbox One version can do Small, Medium and Large ... but I am guessing the Win 10 edition is a lot different? Since I already own the Wii U, PE (phone) and PC version, I really don't want to spend money on another if it can't do what I want. Is the Xbox One version the way to go then? My only worry about the render/view distance on those. Change the world type from "Infinite" to "old" and you'll have what you're looking for. Yes but Old is only 1 map space right? I find that far to small. I really want Large. Creating a new world and making it an Old World limits that specific world size to 256x256. 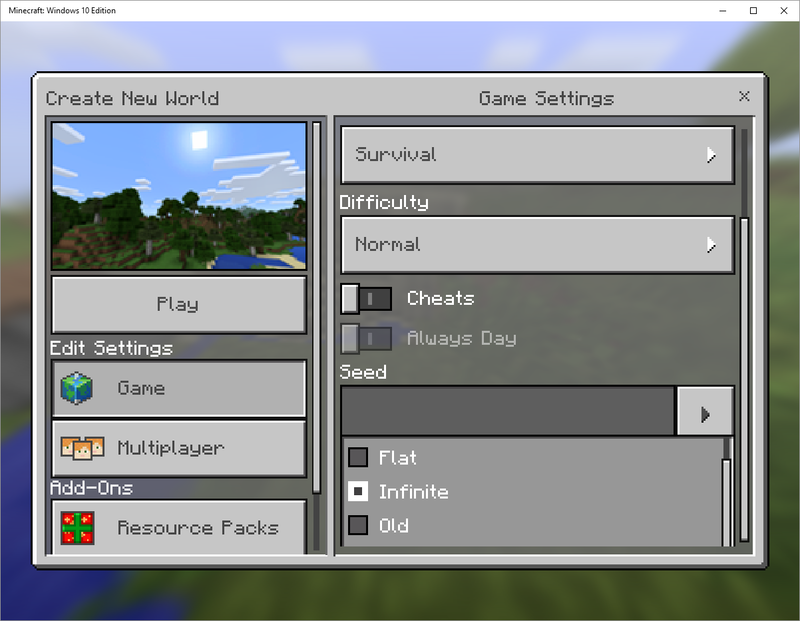 Going into settings>video and activating "Limit World Size" will make all newly created worlds as Old Worlds. This is not what the OP is asking for. There was mention of adding the Small, Medium, Large sizes to MCPE by Tommaso. It just hasn't been implemented yet.